Bengaluru, Jan 26, 2017: The letter signed by AIGP (General) of Karnataka, addressed to 23 district police heads, including Mangaluru and Udupi, asks for their clear opinion regarding withdrawal of cases lodged against minorities for the past five years. It also asks these district police heads to send in a copy of relevant documents along with their opinions to the office of Additional Inspector General of Police (AIGP). In letter dated January 25, 2018, addressed to senior police officers of various districts in the state, written by Shivprakash Devraj, AIGP (General) on behalf of Director General and Inspector General of Police Neelamani Raju, reminds officers of an earlier communication pertaining to dropping cases of communal violence and others against people from the minority community. The letter that seeks to drop cases only against minorities comes months ahead of the Karnataka Assembly Elections 2018. The letter seeking senior police officials’ opinions was written on December 22, 2017. This year alone, the police department has sent two reminders dated January 2, 2018, and January 19, 2018- exposing the government’s urgency in obtaining opinions. The letter even pulls up officials for not responding. 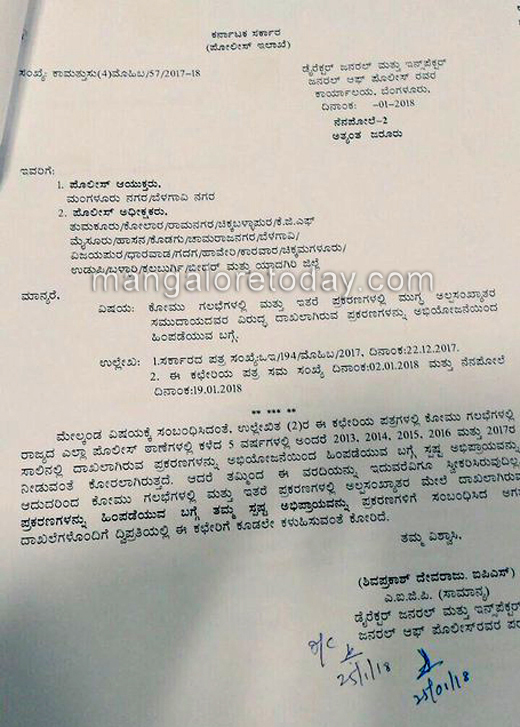 The letter seeks opinions of Commissioner of police Mangaluru, Superintendents of Police- Tumkur, Kolar, Ramnagar, Chikkaballapur, KGF, Mysuru, Hassan, Kodagu, Chamarajanagar, Belagavi, Vijayapura, Dharwad, Gadag, Haveri, Karwar, Chikmagalur, Udupi, Ballari, Kalburgi, Bidar and Yadgir. The BJP has accused Siddaramaiah government of indulging in blatant minority appeasement. "This exposes the dirty appeasement politics that the Congress is indulging in. Despite cases, the government has already declared those accused as innocent and want cases withdrawn. This is the dirty politics of Siddaramaiah government," said Jagadish Shettar, leader, BJP. Reacting strongly, BJP’s Udupi-Chikkamagaluru MP Shobha Karandlaje called the move “blatant appeasement of the Muslim community”. “If this is not blatant Muslim appeasement, then what is? Siddaramaiah is planning to give a clean chit to those accused of serious offences. We will fight against this,” she said. Karnataka’s Home Minister has, however, defended the letter. "Minorities include Christians, Jains Buddhists, Muslims etc. The letter only seeks opinion on dropping cases against innocent people. There is no appeasement," Ramalinga Reddy told the media while refusing to acknowledge the blatant bias that the letter reeks of. Chief Minister Siddaramaiah who has been accusing the BJP of indulging in polarisation ahead of the Karnataka Assembly Elections 2018 while hailing the Congress’ secular stand justified the letter. "The Congress doesn’t fool the people with slogans like Sabka Saath, Sabka Vikaas. Cases against farmers, pro-Kannada activists is also being withdrawn but decision will lie with the Home Ministry," Siddaramaiah said. The Congress government had come under heavy criticism after it dropped 175 cases against members of Popular Front of India in 2015.